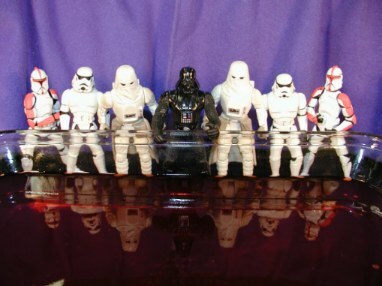 ToyBoxTales.com » Blog Archive » The Crossing of the Red Sea with Star Wars Figures. The Crossing of the Red Sea with Star Wars Figures. This is the TOYBOX TALE that started it all! Several years ago this was the FIRST Toybox tale I ever did (at camp), and the response to it that lasted over a year is what prompted the idea to use this technique for story telling regularly. This entry was posted on Sunday, September 28th, 2003 at 12:00 pm	and is filed under Moses, Season 2, Star Wars. You can follow any responses to this entry through the RSS 2.0 feed. You can leave a response, or trackback from your own site. “Crossing the Red Sea of Jello” is great ! I taught children 0-5 yrs for years, using barbie and ken dolls dressed in bible time outfits. This is wonderful, I’ve been working with children for many years now and I am always looking for inovative ways to get object lessons across and that will stick in the children’s hearts and minds. I will definitely be sharing this with my children during sunday school and children’s church. Haha, this is to good!